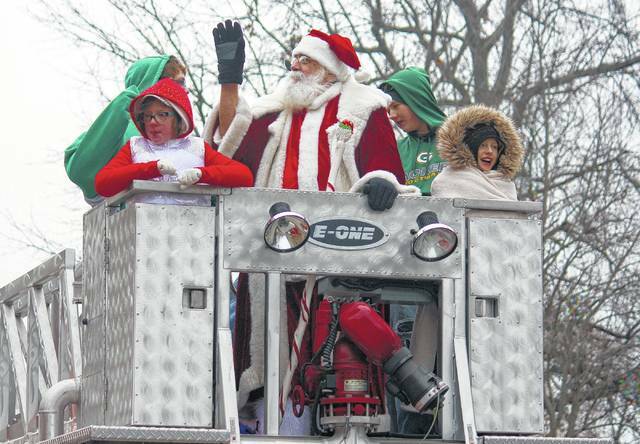 The City Park Santa Claus Chester Polcyn rides on the Gallipolis Fire Department Ladder truck during the 2015 Gallipolis Christmas Parade. GALLIPOLIS — Supporters of an effort to change the name of Johnson Ridge Road to Polcyn Ridge Road met with Gallia Commissioners Thursday in the Gallia Courthouse to voice their approval of the effort during a public hearing. Michael noted his Uncle Don and father were veterans among their other feats of service to the community. “I realize this name change will be an inconvenience to all that live there, myself included, but it’s the right thing to do. We should change the name to honor two great men who gave their lives to Gallia County. It is what we do in America. We name our roads, bridges and parks after heroes,” said Michael. Commissioners said they had a few letters of rebuttal to the change, although none who were present at the meeting voiced that concern. Michael said he had gone through the Ohio Revised Code in an attempt to educate himself on the name changing process and said that it was possible with “good cause for the change of its name.” He felt there was good cause and nothing detrimental to the “general interest” of the public with the change but admitted it would be inconvenient for others. Rebecca Meaige, another resident along the road in question, voiced support of the endeavor with her daughter present but abstaining to speak. Commissioners said they would consider the request but acknowledged that whatever was decided one party would walk away unhappy. They also said they appreciated the years of service to the community the Polcyn family had made to the area. If commissioners rejected the request, they said it was not to insult those years of service, but to also consider the concerns of nearby residents. No decisions were made at the hearing.